This is a wonderful article from Laura Putnam over at findinghome.com. Laura writes about the lessons she has learnt in styling bookcases and has shown a before and after picture which I have included below. It looks amazing. 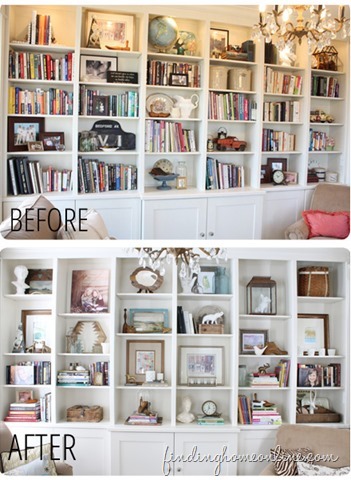 Head on over to her site by clicking on the link for lots of tips and ideas about achieving the look that you are after for your bookcase and home. Categories: Home Styling | Tags: Bookcase, bookcases, books, clutter, cushions, dishes, Laura Putnam, nick knacks, pictures, shell, sofa, stairs, style, vintage | Permalink.